Always listen to your artist. Not your mailman, not the internet, not your Uncle Joe, not your friend. Regardless of anything you may have done in the past, I ask that you follow my instructions. I know what heals my tattoos, as well as what is recommended by the Oregon Health Department. 1. DO leave the bandage on overnight. 2. In the morning, WASH YOUR HANDS, remove the bandage, and wash the tattoo gently BY HAND (no washcloths) with warm water and unscented Doc Bronners brand soap. NO body washes, NO tea tree soap, NO antibacterial soaps, they are too harsh. Make sure any blood or goo is gone. Pat dry with a clean paper towel. DO NOT RE-BANDAGE the tattoo…. leave the tattoo open to the air all day. 3. WASH YOUR HANDS before touching or applying lotion to a new tattoo. 4. DO use a LIGHT FILM of Lubriderm Brand Lotion once a day, generally in the evening. You only need a thin film of lotion. Do not lotion the tattoo directly out of the shower, let it air dry for at least a few hours. Do not over-lotion the tattoo! Use lotion sparingly. Do not rub it in. Only use unscented Lubriderm Brand Lotion. Do not use lotions or oils with fragrance, color, tea tree oil, etc. 5. DO NOT USE Bacitracin, Neosporin, Vaseline, Aquaphor, A&D ointment, commercial ‘tattoo aftercare’ products, or anything that is an ointment, oil, thick, or sits on the surface of the skin. 6. DO wash your tattoo gently BY HAND, with soap and water, once a day, everyday. When the tattoo begins to peel, do not try and scrub off the peeling skin! It will fall off on its own when it is ready. 7. DO make sure your bedding and clothes are clean, while the tattoo is healing. 8. 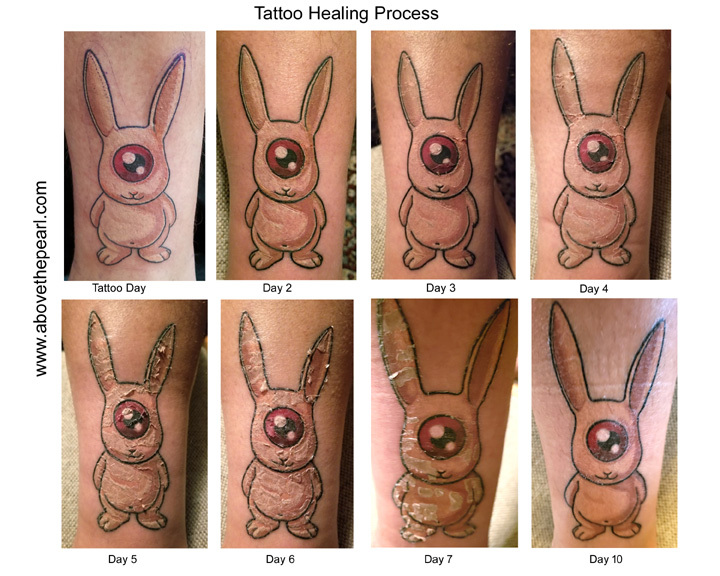 DO NOT expose your new tattoo to direct sunlight for 7-10 days, or until healed. 9. DO NOT soak in a tub, sauna, steam room, hot tub, or go swimming while your tattoo is healing. Showers are fine. Try not to let the shower hit your tattoo directly. Doing so can knock off flakes and scabs before they are ready. 10. DO NOT let clothing irritate your new tattoo. Cotton clothing is better than synthetics. Loose clothing better than tight clothing. 11. DO NOT RUB OR PICK at the healing tattoo, as tempting as it may be. Loss of color and/or infection can occur. It is important that the thin, tiny scab stay on as long as possible during the healing process. Your body will complete this process all by itself. For itching, use lotion, or slap the tattoo. 12. DO use 30+ SPF sunblock after the tattoo is healed, for the rest of its life and your life. Extreme sun and exposure over the years can, and will, fade your tattoo. *please note: It is normal to lose approximately 1/3 of the color in the first few days. A percentage of the ink is in the outer layer of skin, and will slough off in about a week following treatment. Some clients do not lose 1/3 of the color, some lose more. Remember that everyone is different. please see the picture below to understand the healing phases.